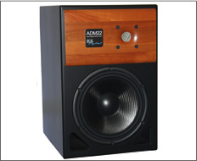 The ADM22 is a redesign of the flagship ADM20 DSP mixing and mastering speaker (the first digital phase-linear studio reference monitor in the world in the original ADM2 model). Created to bring the incredible performance of the ADM20 to even more studios, the ADM22 has all the basic sound reproduction features of its predecessor, including full Firtec DSP implementation. The patented Firtec system produces a linear phase output in correct time alignment across the entire frequency range, which brings "the sonic truth" to your audio--completely transparent, dynamic playback that reveals every single detail. The waveguide neutralizes the effect of the edge of the box construction, and intensifies the linearity of the frequency response apart from the signal processing. The 1" high frequency radiator features distortion-free reproduction even at higher volume levels. The 8" carbon driver is handmade in Germany, and features an optimally stiff membrane combined with low weight. This avoids the breakup of the partial movement at higher volumes, again bringing absolute clarity to your music. The built-in analog to digital / digital to analog conversion is 24 bit / 192 kHz. This is as "plug and play" as it gets! 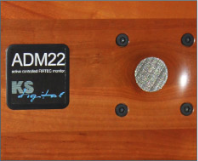 The ADM22, with its Firtec DSP implementation, has a guaranteed flat output when linked into your system. The speakers themselves are built to the highest standards for vertical or horizontal use, but KS goes one step further than all other manufacturers… with the KS patented Firtec FIR-based DSP, the speaker box itself is eliminated from the equation! Each speaker leaves the factory in Germany with custom DSP integrated solely for that particular cabinet, so the output is completely flat and corrected in phase, frequency, and time. This is not achieved by using standard equalization and filters like other manufacturers' products, which leads to phase issues and compromised dynamic response… this is accomplished with advanced FIR technology exclusive to KS Digital. Utilizing Firtec is like taking the veil off of traditional studio monitoring and DSP sound design, as it presents the music phase-perfect with full dynamic response--no compromises are made to output the signal as perfectly as it arrives at the input. All amplifiers and digital controls are mounted on the back of the ADM22, and everything is controllable via the optional remote (hardware or software). By adding the optional 24 bit / 192kHz digital input section and the remote, the ADM22 becomes a full-blown analog/digital powerhouse just like the ADM20. However, even this system works differently and more effectively than competitors' products. In most digital DSP speakers, there is no volume control other than attenuating the digital signal being fed to the monitors. With KS Firtec DSP, a full-blown analog and digital monitoring section can be achieved with the remote, and it attenuates the sound AFTER digital conversion to the analog power amplifiers. Thus, the digital signal is not attenuated, giving you full bit depth and resolution, rather than a reduced representation of your music! It also eliminates expensive analog or digital outboard monitor controllers, since the ADM22 with the digital option and remote option gives you even more capabilities, all built into one! Since the release of the ADM22, engineers have been commenting on how this system is truly a new achievement that eclipses competing speakers in the marketplace. "Absolute clarity," "stunning detail and dynamics," and "this is what I always imagined sound could be" are just a few of the remarks we've heard. Test drive a pair for yourself and hear what everyone is talking about! 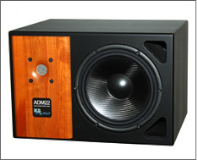 As with all KS Digital studio speakers, the ADM22 is magnetically shielded for safe use near computer screens... and it is hand-built in Germany for you and comes with a signed Certificate of Authenticity, as well as a full 2-year warranty. ... one of a kind room presentation, which is top class. ... you can detect every single musician on the recording in millimeters precision. ....here is almost a 3-dimensional picture - impressive. … on the other hand, it does not pardon any weak mixes or phase problems in mixes, which you as a professional would hope for. ... it is excellent in the true impulse representation of woofer frequencies. … represents a perfect model in linearity, with an excellent impulse response and perfect room presentation. Dimensions H 42 x W 29 x D 35 cm, 16.5" x 11.4" x 13.8"